OK so the title was a bit of a stretch, but this article is all about how to get the perfect tan for summer. The main ingredient of fake tan is DHA. This ingredient interacts with the amino-acids in dead cells on the surface layers of our skin. This reaction takes a few hours to mature (up to a few days) and darkens the cells. These cells naturally slough off, hence why a fake-tan fades after around 7 days; depending on how evenly your skin cells turnover is dependant on whether your tan blotches or fades away naturally (think of it like a PEZ sweet-dispenser, with a cell moving slowly from bottom to top over 28 days). The acidity of our skin (slightly acidic at an average of pH 5.5 but actually anywhere between pH4.5 and pH6.2) affects the resulting colour. The micro-variances in skin acidity from person-to-person means that a fake tanning product will look slightly different on everyone; this ideally results in the tan ‘adapting’ to your natural skin tone. When we wash our bodies, use oils and moisturise etc, we are changing the pH of our skin. When we shower, skin oil is neutralised as water is a pH7, this is why water can dry the skin out as our body has to replenish the broken down moisture barrier and rebalance the acid mantle. It can take anywhere up to a full 12 hours for our skin to rebalance and restore itself and this is the same for both body and face. Make sure tan is always applied to ‘dirty’ skin. Now I don’t mean dirty-dirty, as in muddy, but skin that has been showered the night before or if it’s at night, that morning. This ensures that your skin is at its most natural pH balance which will result in the best possible tan. Skin needs to be well exfoliated. If skin is covered in cells that are about to drop off, your tan won’t last long and will almost immediately start to blotch up. Use a dry brush, all over, on dry skin before you get in the shower; this remove the very top layer of loose cells. By ensuring the skin has been well-exfoliated with a body-scrub and/or scrubbing tool, then using a moisturiser, fresh skin cells are revealed and then balanced ensuring your tan will last for as long as possible. Do all this, as well as shaving/waxing any necessary areas, again, the night before or if it’s at night, that morning. To maintain your tan, exfoliate your body once to twice a week and use big, circular, buffing motions (which you should anyway) but don’t exfoliate like you’re peeling a scratch-card. If you exfoliate your face regularly with a chemical exfoliator you will find your tan won’t last as long (I’ve known one particular chemical exfoliator to just take my tan off!) but if you do this regularly and have been doing for at least three weeks, using a manual exfoliator (scrubs/beads etc) isn’t strictly necessary as you’re mostly exfoliating fresh skin cells. If you want your tan to last longer in favour of optimum skin health, maybe cut down your chemical exfoliation to every other day, just don’t tell me about it. Never use your hands for instant-tan (you’ll generally be ok with using your with and gradual lotions); you will never get rid of all the tan off your fingers and it’s always a dead giveaway of a fake-tan, plus men tend to have drier hands which will show this mistake more clearly. If you do get tan on your hands, wash off with very soapy, cold, water as heat activates the tanning ingredient; dish detergent works well for this but user a good moisturiser when you’ve finished. Always use a fresh/cleaned tanning mitt. I buy mine from pound-stores or similar as they’re all pretty much the same, whether they’re branded with Xen-Tan or Poundland. I also use latex-gloves because tan always seeps through the top of the mitt and coats the side of your hand; you can buy these from Boots. Use a light, gel moisturiser and apply a coating to your knees, elbows and wrists and ankles as this will prevent tan from building up in these areas. Not really a gel but loving the very light Verviene lotion with SPF from L’Occitane at the moment for this; works like a dream! Take a generous amount of fake tan by pumping it into the palm of your latex-gloved hand and slap it on your body. Roughly rub it in roughly and then pop-on your mitt and start to massage into the skin in circular motions. You can’t beat someone else doing your back but if that’s not possible, Xen-Ten brought out a fab back applicator which makes life a little easier. Let your tan dry and then apply a loose, light robe and float around the house in it for a few hours. Avoid sitting down in a slouched position as you’ll get lines on your stomach. I also recommend avoiding underwear during this time, as your inner-thigh gets very hot which can disproportionately speed-up the tan. When it’s time to shower, rinse off and gently user a shower-lily or similar and buff the tan to even out any areas that might have blotched (it’s rare that it doesn’t happen, don’t panic). Afterwards, pat your skin dry and then use a good, gel moisturiser to hydrated the skin and help lock in the colour. This is my favourite tan for Summer 2013. Part of the new Soleil de La Mer collection, it builds to a solid, natural tan over a few days. The body lotion has that great Crème de La Mer fragrance (lime tea extract) and is infused with the skin rebuilding, protecting and nourishing Miracle Broth. It’s streak-free and doesn’t leave you smelling like old-biscuits. It’s especially perfect for those of you who aren’t experts at applying instant fake-tan. 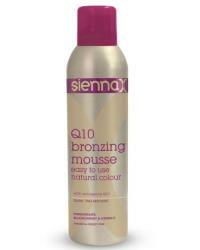 Brand new from Sienna X, this lightweight mousse foam is ridiculously easy to use, smells sweet and blends very easily. It contains Q10, a powerful anti-ageing and skin conditioning agent, that leaves skin very soft after use. There’s also blackcurrant, babassu, pomegranate and vitamin E. It gives a really fantastic colour and there’s no nasty biscuit tan smell. My only reservation with this is that you shouldn’t wash the guide colour off for 8 hours after application; for me, this involves spending sunday in my dark-grey dressing gown. This article first appeared on MANFACE written by Thom Watson. It was published on Friday 12th July 2013 and was last updated on Monday 3rd April 2017 at 3:33pm. It's categorised under Body, Clarisonic, Editorials, KIKO Cosmetics, La Mer, L’Occitane, Sienna X, Tanning, The Body Shop, Xen-Tan where you'll find more related content. Problem is that I have grey hair and facial hair and I end up with an orange beard and moustache. Any solution other than to go bald? I thought I’d ask my favourite tanning expert, Sienna X Ambassador James Harknet on your behalf. Fake tan is by far one the hardest things to get right! Some very useful tips in this post thank you! Thanks for the comment. Glad you liked the article! What hopes for those of us who mostly burn and are allergic to fake tan? Haha! Me too. I’ll check out the tan you mentioned, I do love a beauty bargain. I’m currently in the market for a good one for my face but as that’s very difficult to cover up when it goes wrong, I don’t know whether I’ll risk a budget brand. Great post Thom and you make some fantastic points. It’s so important to follow thorough application to get a natural looking tan. Not sure I agree with the ’12 hour’ thing though. Unless someone is washing with a strong alkaline soap or their skin is already damaged, then it should take any longer than 20-30 minutes for a healthy skin to return back to normal ph. I always leave it about an hour, just to be on the safe side. Thanks! Well it should always be a good few hours before, 12 to be absolutely safe airing on the side of caution. This advice comes from the top (Jules from St. Tropez) and when it comes to tanning, I wouldn’t be arguing with him haha! Can you use the creme de la mer one on your face? OR do you have any other reccommendations for tanning the face? Hey Geo. You certainly can use the Creme de la Mer on your face. My favourite for face however is Xen-Tan Face Tanner Luxe.